Pancakes make a great breakfast, dessert or even a snack when you’re getting peckish at 4pm but it’s just a little too early for dinner. This recipe from Little Miss Bento is the perfect way to add some fun into this family favourite with the cutest little bunny in town. First things first, get together all the ingredients on the list below. Pipe Miffy’s features onto a sheet of baking paper using melted chocolate. Set these aside to harden. Sift bread flour, cake flour and baking powder into a bowl. Add sugar and whisk. Ad the egg and milk mixture and mix well. Add melted margarine and vanilla essence and mix well. Now you have your pancake mix it’s time to cook! Arrange pancakes in stacks of 4-5 on a plate. Insert 2 rice crackers just below the final pancake in each stack for Miffy’s ears. Serve with fresh fruit and chocolate sauce or honey. Dust with icing sugar. Yum! 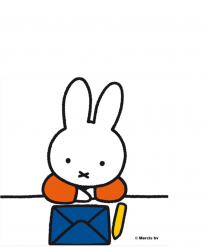 For more Miffy-themed recipes, buy the Miffy Cookbook HERE.